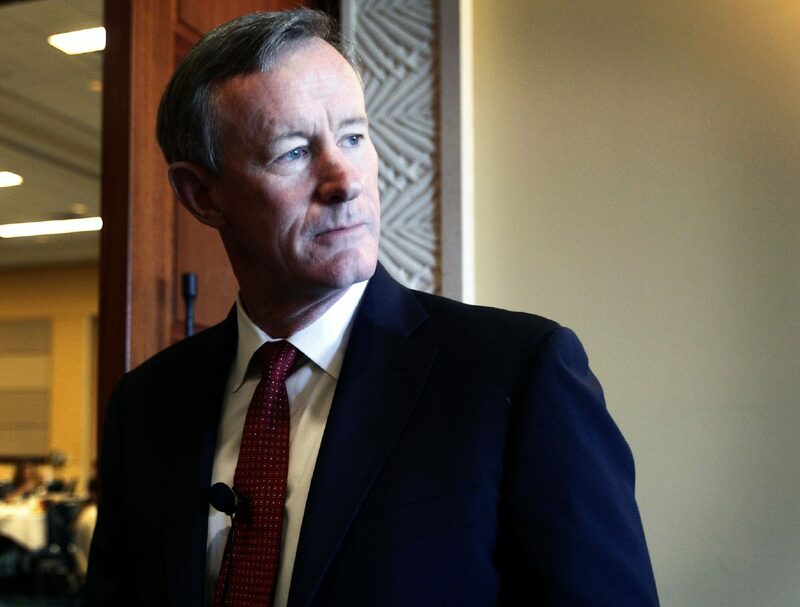 AUSTIN— The University of Texas System announced Friday that Chancellor William McRaven will step down from this role in 2018 due mainly to health issues, a news release states. “This decision to transition to private life was one of the hardest I have ever made, but recent health concerns prompted Georgeann and me to reflect on the years ahead and think seriously about things we still want to do as a family. While I’m on the road to recovery and am grateful to my UT physicians and the good wishes and prayers of our many friends and colleagues, I believe it is time to segue to several other passions in my life that I’d like to experience, and much of that will also involve teaching and writing,” McRaven said in the release. In the release UT officials state the chancellor expressed interest to the board in continuing in an advisory role in the management and operations of the Los Alamos National Laboratory, if the UT System successfully acquires management of the labs. Los Alamos is currently under the management of the University of California, but UT applied this week to take over the labs. The U.S. Department of Energy is slated to announce the successful bidder by the spring of 2018. McRaven took the top leadership role at the UT System in January 2015, and has since been overseeing its 14 institutions, more than 20,000 faculty and more than 200,000 students across the state. Before the transition to academics, he spent 37 years in the military most recently as Navy four-star admiral and ninth commander of the United States Special Operations Command, leading renowned operations such as the rescue of Capt. Richard Phillips and Operation Neptune Spear, which resulted in the death of Osama bin Laden. Most recently, he unveiled a series of goals dubbed Quantum Leaps focused on strengthening the pre-K through 12th-grade pipeline of students who would one day be attending UT institutions. “I want to thank the chancellor for his service to the UT System and commend him for his leadership in areas of importance to the Board. Among these are ensuring we have the best talent leading our institutions, driving inclusion and healthy campus climates, and challenging us to make investments so that important national and global stakeholders are asking, ‘What does Texas think? '” said Board Chairman Sara Martinez Tucker in the release.